I’m ashamed to say I’ve never visited the Jewish Museum in Camden before. I mean, I’m not actually Jewish, but that’s a terrible reason (arguably a greater impetus to visit in fact), and my husband is and therefore our child has Jewish heritage. Two of my friends have worked there (one still does). But this post isn’t about how I’m a terrible person; it’s about how I’m a ludicrously emotional person. What finally shoved me through the doors was this small but beautifully curated exhibition of the work of Judith Kerr. I don’t know of a child who didn’t grow up on The Tiger Who Came to Tea; it was one of Ramona’s first memorised books, that she’d ‘read’ to me before she knew which word was which. It has charm, more than a touch of the bizarre, lovely touches of mundane realism that ground it and, most of all, gorgeous illustrations – the deft work of a talented woman who is still announcing new work at the age of 92. Kerr was very nearly silenced before she started. Fleeing Nazi persecution in childhood, her family ended up in the UK via Switzerland (see what ‘migrants’ can offer? Not that it should matter whether they turn out to be artistic genius or not; human beings are always human). Here she has been ever since, and both the famous Tiger and her series of Mog books based on the adventures of her gorgeous tabby have won and broken the hearts of three generations of children (and their parents). I finally read Goodbye Mog for the first time, at Ramona’s insistence, sitting in the museum, in a giant cat bed. I cried and the beginning, and I cried at the end, and Ramona gave me a gentle cuddle and then sprang off to see more. The four sections of the exhibition take in Kerr’s childhood, with a smattering of her youthful works of art – and a funny aside about how she failed the book illustration module of her first formal art training because she was so focussed on painting – leading into the more serious side of her work through novels such as When Hitler Stole Pink Rabbit. More teary eyes. 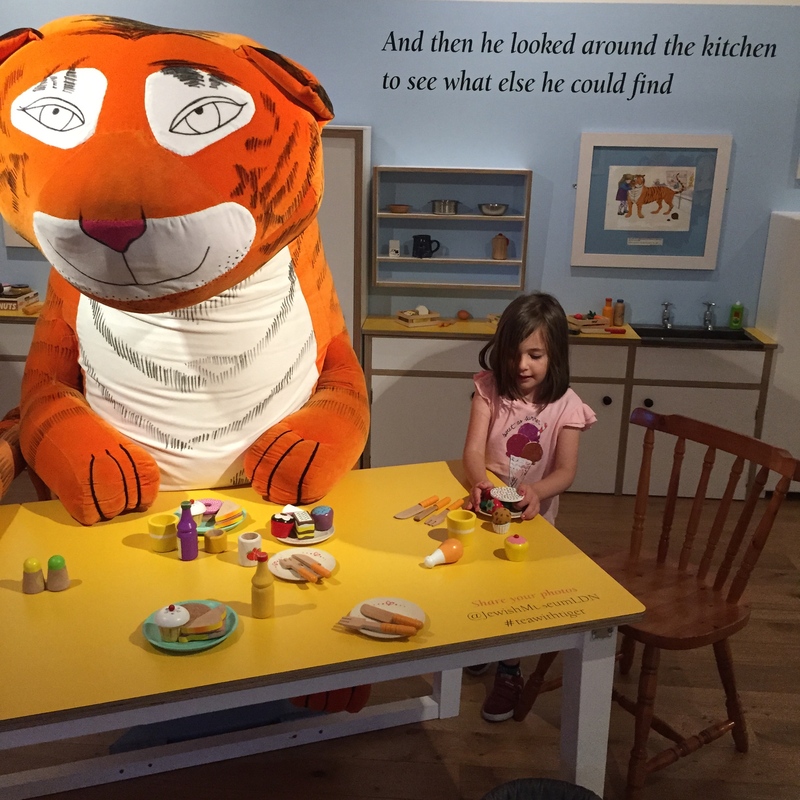 Suddenly, you turn right into Sophie’s kitchen, where a Tiger sits, devouring the all the sandwiches on the plate and all the tea in the teapot. Yep, as I sat in Sophie’s Daddy’s armchair, and tried on Sophie’s Mummy’s orange coat – Ramona in Sophie’s red one – I cried some more. I’m ridiculous. Finally, kids can crawl through a cat door (adults don’t have to) into Mog’s world, and dress up as her as they curl up in her bed and have a catnap. Perfect. Although we missed it, there is daily storytime at 10:30 while the exhibition is on, and there are arts and crafts workshops and activities available at other times. I’m absolutely gutted that I missed the opportunity to book a slot at Kerr’s talk – in person! – about her work. The exhibition continues until mid-October. Entry to the recently beautifully rebuilt museum is £7.50 for adults and £3.50 for children (5-16) with concessions and family tickets available. That of course includes access to the rest of the museum too, which is rich with all aspects of Jewish history; the Holocaust, yes, of course, because how could it not be, but also the reality of Jewish life today, and Jewish practice in real homes of varying observance. It’s a gorgeous, airy, space and I intend to go back and explore properly, possibly without an overexcited 5yo, on another occasion. A note: the museum is open on Saturdays, which is when we went, but due to the kosher licence the cafe does not operate during Shabbat. No disclosure needed – although I do have a friend that works there she had no idea I was going! We recently got back from a fabulous end of school break to Sweden’s sometimes-sunny capital, Stockholm. Despite its reputation as an expensive city, we found that with a little bit of budget planning it was a great value family destination – and despite the unreliable and variable weather, still a really beautiful city packed with architectural gems for the grown-ups to sigh over. I’ll be breaking down a few individual recommendations for places in separate posts and sharing more photos, but if this is a destination you’re thinking of going to with kids, here are some reasons to make the leap and book away. If you’re not somebody I know IRL, then it might be helpful to know that ours is a family of three with a 5yo who starts Year 1 in September. 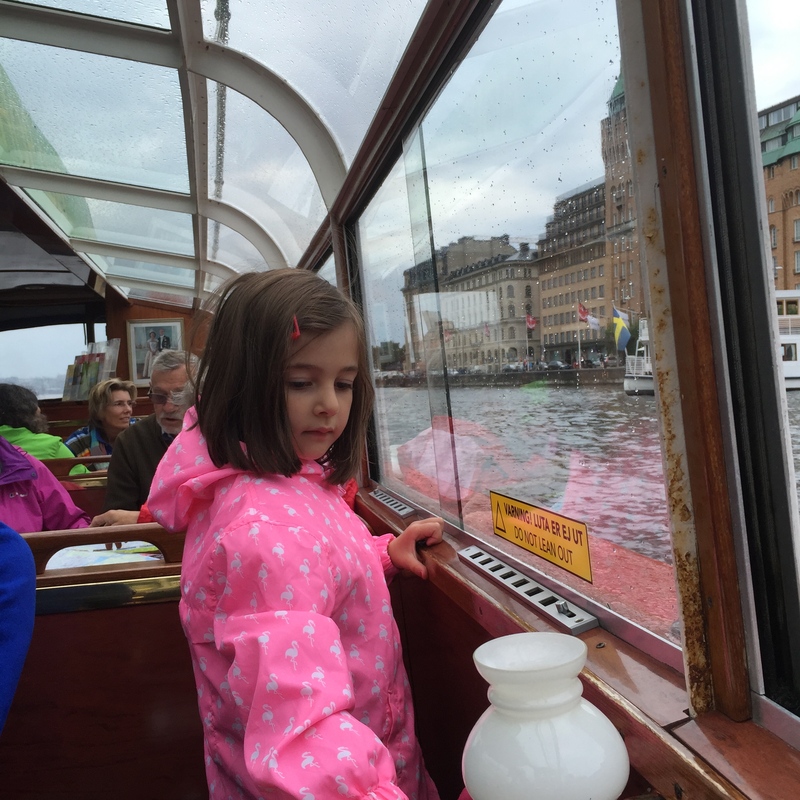 Kids are welcome everywhere in Stockholm, and there’s loads for them to do. 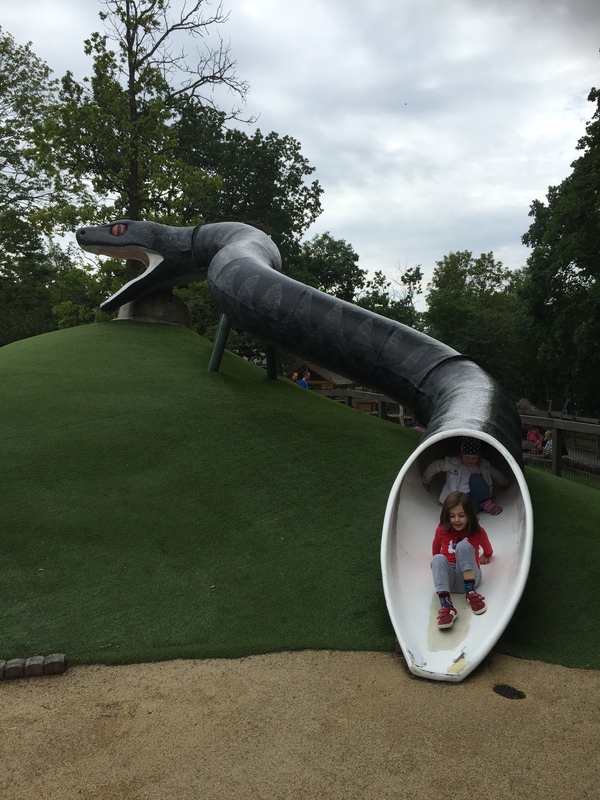 For the most part (unless – like Junibacken or Skansen – it’s particularly aimed at children), they get in free to museums and the youngest travel free on both public and some private transport. 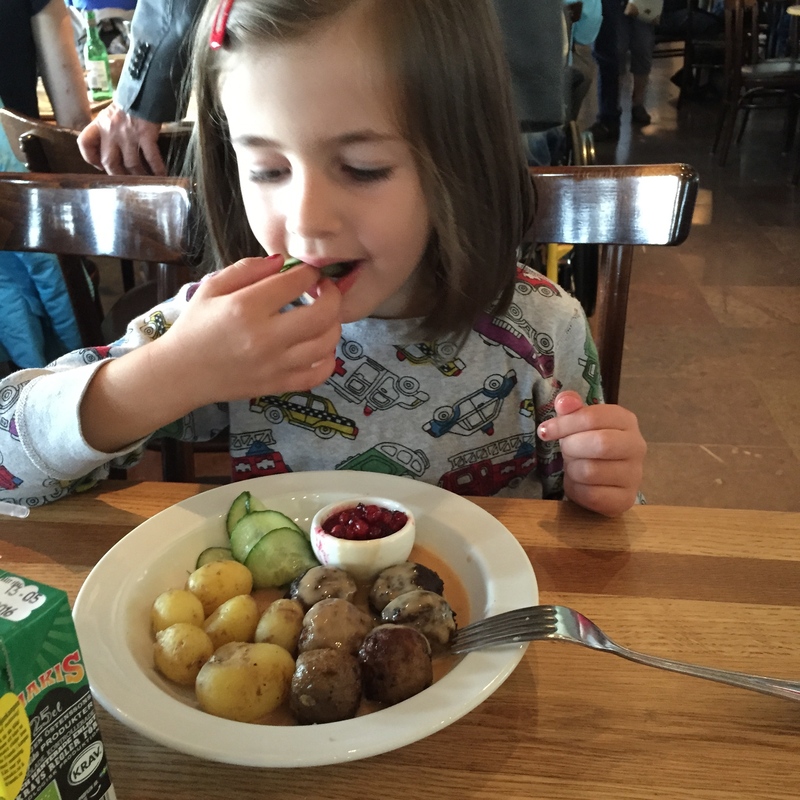 Attractions have children’s menus, and ordinary cafes and restaurants we went to were very relaxed about making minor modifications to freshly prepared food – eg leaving off dressings – to accommodate children’s requests. 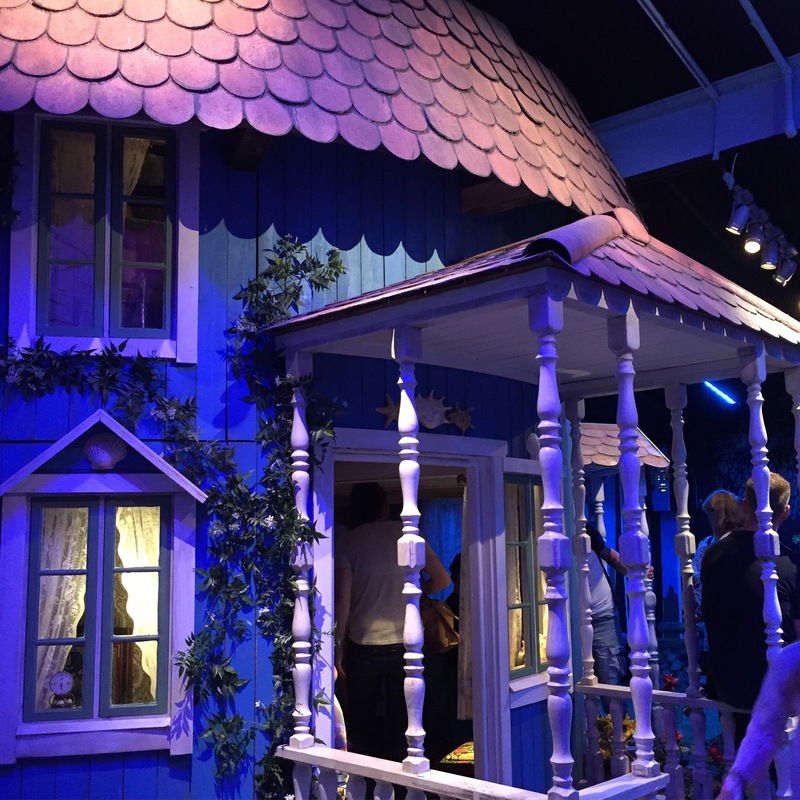 As previously mentioned, there are attractions that are specifically aimed at children; I’ll write about the amazing Astrid Lindgren story centre, Junibacken, separately as well, but it’s an absolute must do. With a permanent play village based on classic Swedish children’s literature and a play house designed after Pippi Longstocking’s Ville Villekulle, it’s an absolute joy. To make matters even more perfect, this year it’s host to an amazing 70th anniversary Moomin Valley play village, complete with Moominmama’s house, the tiny carousel from Who Will Comfort Toffle?, darting fish in the river by Snufkin’s boat, fruit falling from the trees and a glowing campfire for the grownups to sit around while the kids go mad. Another one for the to do list is the huge outdoor cultural centre / museum / zoo, Skansen, at which it’s all too easy to lose a whole day – or at the very least half of one – meandering about. 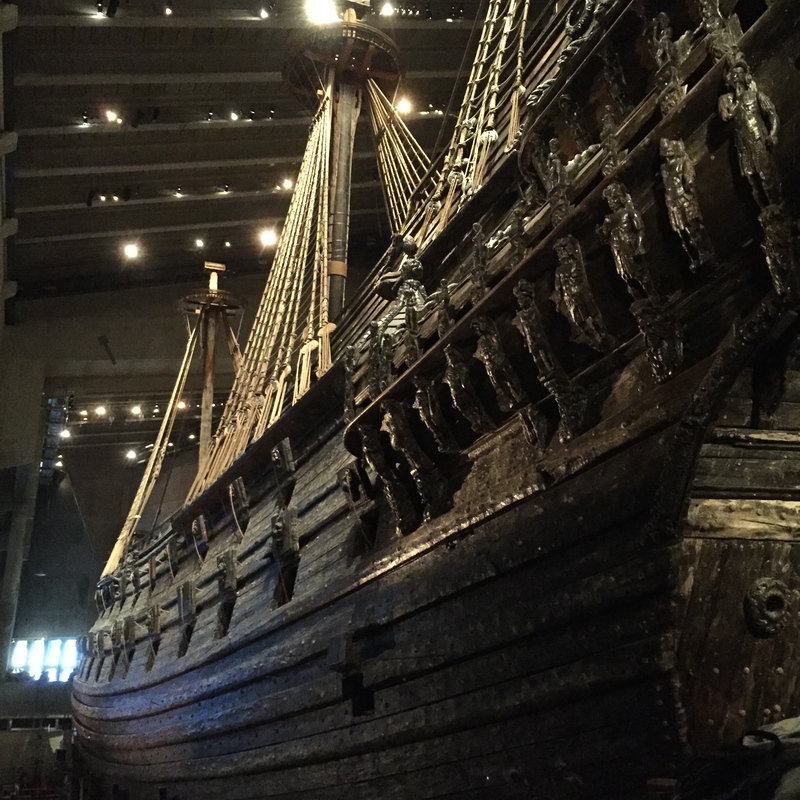 Both of these – plus the famous Vasa museum and quite a few others – are on the royal park island of Djurgården which is very easy to get to from central Stockholm – another consideration with kids. If you’re staying near the main waterfront it’s a short ferry ride or a few miles’ walk. Most of all, if you’re not linguistically blessed – my husband and I are both bilingual but in different languages, neither of them remotely Nordic – the stress of trying to navigate overseas is drastically reduced by the fact that everyone speaks English very well and even announcements on the commuter trains are made in Swedish and English as a matter of course. More great suggestions – including ones for libraries that I really wish we’d had a chance to try – are in this budget-conscious Guardian article. Stockholm is a busy capital city, and as such every kind of food – and price point – is represented. As a family with a young child we often couldn’t plan lunchtime restaurant meals so ate in the museums, and found the quality to be high. 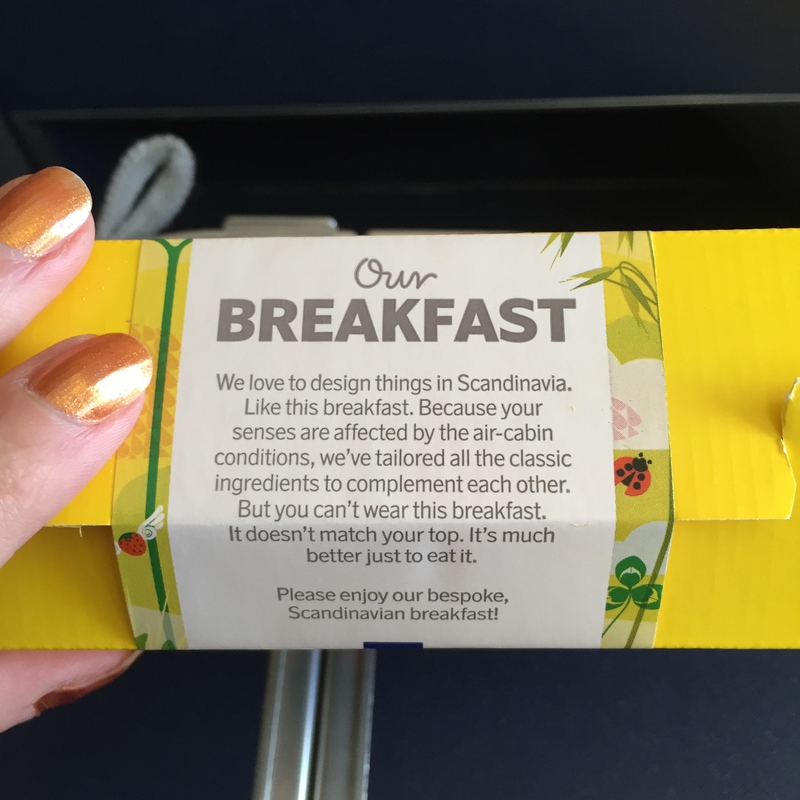 The costs are roughly equivalent to London (eg a meal for three with cooked dishes in a museum cafe was around 400SEK or £30, but there were plenty of cheaper city-based cafes, fast food restaurants and tea houses). However, the quality was very decent and the quantity substantial, even for kids. Our hotel also had a fulsome breakfast buffet, and you might find you end up eating a bit more often, particularly if you go in for the Swedish fika (afternoon coffee and cake break), but with local traditional foods such as open shrimp sandwiches, meatballs, pancakes and sweet, bready cinnamon rolls, you certainly won’t be short of things to tempt even the fussiest eater. 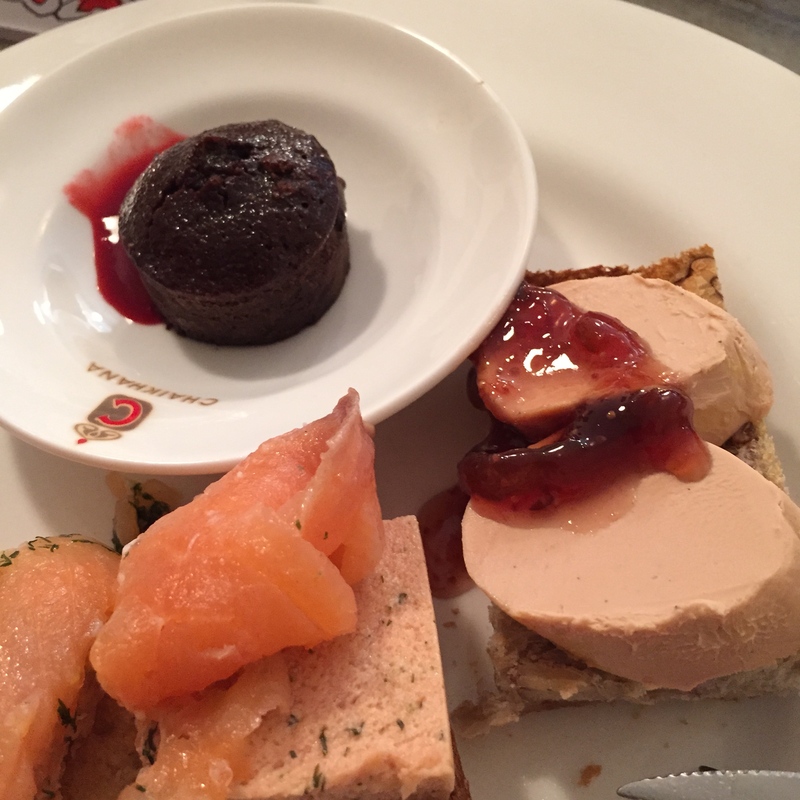 As for me, I was knee deep in bread and crackers – my carb-heavy happy place – and am pretty sure that after five days I was around 67% knackebrod (crispbread). Cars are definitely not needed as Stockholm is a very walkable – and what isn’t is catered for by boats, trains, taxis and buses. It’s a city of mainland and islands, linked by bridges and boats, Djurgården being, as I said, the one you’ll want to spend the most time on, as it includes the Vasa museum, Junibacken, Skansen, the Tivoli amusement park (we didn’t go in but it did not look suitable for the faint-hearted!) and many more museums and galleries. I already mentioned that Djurgården is very walkable from the mainland, and we did it in 40 minutes from our hotel which was opposite the bridge into the old town (a distance of a little over 2 miles, but with short legs accompanying us!). If anyone in the party is not up to walking or you just want the fun of the ferry, a one-way crossing is about 50SEK per person – free for under 5s, and reduced for older kids – or an all day “Hop On, Hop Off” boat pass starts at 175SEK per adult; or there are combined bus and boat options if you plan to cover a lot of ground. I would note here that I didn’t see any easy accessibility options on the boat – certainly if we’d had my mum, who uses a wheelchair, with us we’d have had to go for a commuter boat instead – but you can fold and pop a buggy on the deck. Vasa. No pictures – and certainly none from an amateur’s iPhone – can do this vast beauty justice. You can also get combined deals with the My Stockholm Pass, which includes a lot of attractions and dining discounts. We felt it was better value to pay individually – the concierge at our hotel pointed out you needed to be able to go to at least 2-3 attractions a day to make it worth it – but it depends on how much you’re intending to do. While sometimes the whole joy of a family holiday is in being able to go away together for a good long time – whether to Dorset or Disney World – both budgets and the constraints of annual leave and school holidays can render shorter breaks more desirable. The flight is around 2 hours out and a little more back, and that allows you to really maximise time – we arrived at lunchtime on Monday and left on Friday evening so we had pretty much the whole five days to play with. On budget – our 5 day break in the last week of July including upgraded flights, 4* hotel and spending money came in at around 80% of the cost of our mid-September 3-key hotel break at Disneyland Paris (and that was in 2013 with the 2 days and nights free option thrown in). Now while that’s not exactly cheap, we were lucky to be able to take the opportunity to blow out a bit, and did. Using options like Air BNB, booking cheaper flights, minimising our trinket shopping and planning our meals a bit more carefully, we could have made it a substantially cheaper break. 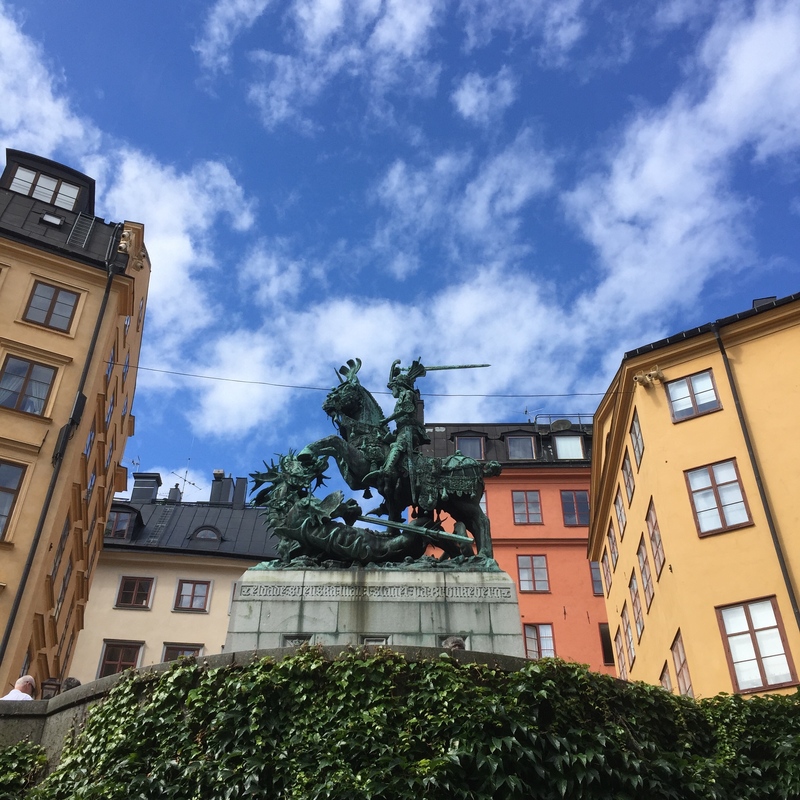 Also, had it just been me and him going we could have hit the highlights in fewer days – as it was, we dropped the pace to a 5yo’s, and stuck to one attraction and a walk around the Gamla Stan (gorgeous but touristy medieval old town) every day. In sunny moments, there are few more gorgeous places. 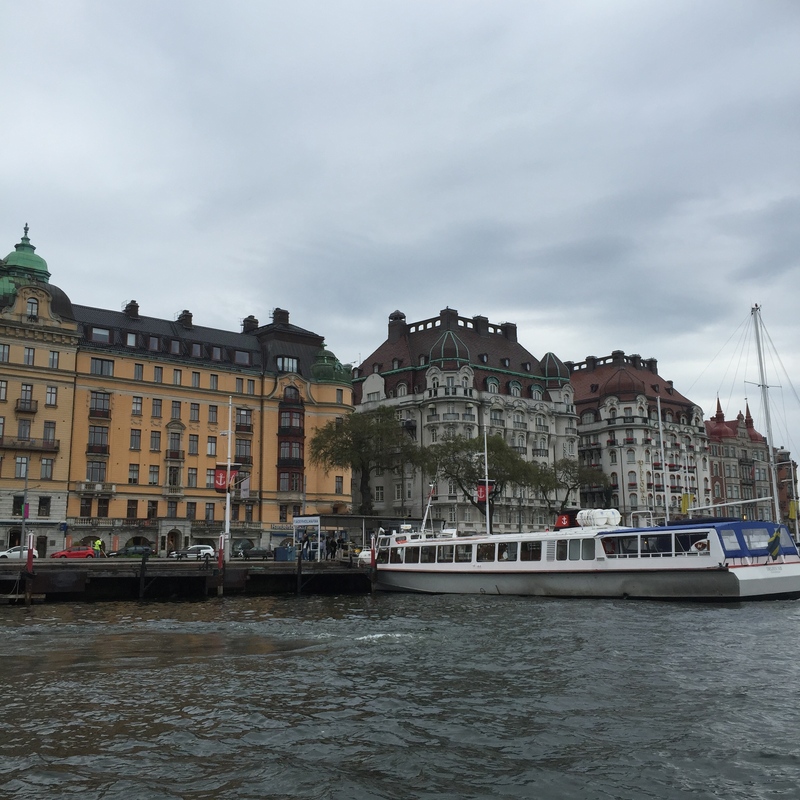 In all, Stockholm was definitely one of our favourite family breaks to date. Our daughter declared that, while nothing could beat Florida, this was her second favourite holiday ever – high praise indeed considering the distinct differences between a city break and a theme park extravaganza. She particularly enjoyed knocking around the old town and developed such a fondness for the Chaikhana tea house (she’s her mother’s daughter) that we ended up making three visits. Even though we ended up caught in a couple of deluges, she really enjoyed pottering around the city and exploring, and it made it a very relaxing break for us adults too. Are you tempted? I, for one, can’t wait for an excuse to go back. Those of you who have been here before know I like to dip my (peep)toe into vintage waters with increasing regularity; I don’t have a set era as such and quite enjoy mixing things up, but mid-century is as good a description as any – by which I mean roughly 1940-1965. Enter the Imperial War Museum, whose Fashion on the Ration exhibition arrived – presumably by design – in the midst of a mixure of vintage hipster trendiness, the resurgence of traditional skills during a period of austerity, and the popularity of various fashion exhibitions in London (spearheaded by the V&A, whose Savage Beauty – a spectacular Alexander McQueen retrospective – is also still on, though only until 2nd August, and very much worth seeing). 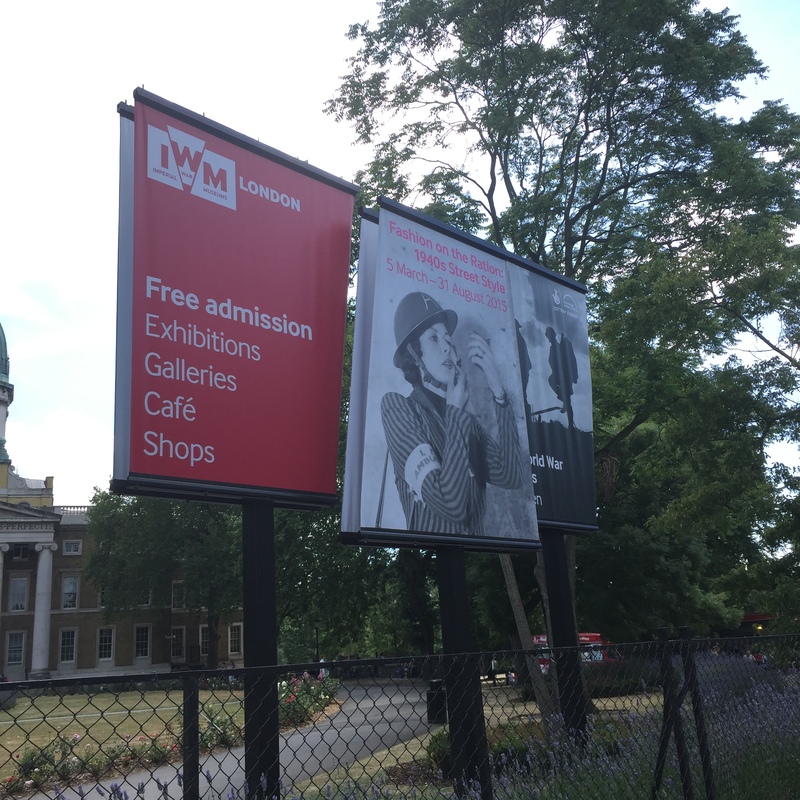 The IWM’s exploration of 1940s street style is a short but rich, beautifully curated show, taking in the beginnings of clothing rationing in the UK – which lasted into the 1950s – and with a thorough look at the Utility clothes era. This, for those unfamiliar with this period of history, was the point at which the British government got directly involved in clothing design through the creation of affordable, long-lasting clothing that aimed to achieve greater efficiency and equality in the use of precious clothing coupons. It ended up being the basis for modern clothing and fabric quality standards – and the bright prints, use of durable fabrics like rayon and elegant but simple styling so as to use resources sparingly all contributed strongly to what we probably have in our minds when we think of “1940s fashion”. Drafting in well-known designers of the day helped to make Utility clothes desirable – they were originally greeted with suspicion, unsurprisingly – and a particular look emerged that balanced shabby chic (when it didn’t look good to be too well turned out with a war on) with morale-boosting looks said to support the war effort (can’t have the enemy see us looking dispirited!). What makes this collection particularly lovely is the individual element; it’s peppered with stories about the original owners and makers of the fashions on display. One of my favourites was a gorgeously cut onesie for wearing over a nightie if an air raid happened overnight. It was accompanied by a note from the original owner expressing her surprise at owning such an item, and it had something noticeably lacking from the recent resurgence in popularity of jumpsuits – a rear flap for attending to a call of nature without having to disrobe! The exhibition also makes the point that we’ve gone somewhat full circle with fashion – after a post-war boom period of disposable, quickly cycling trends, we’ve headed back into a make do and mend-inspired, thrifty era of slow fashion. And since 1940s and 1950s fashions were often built to last, some of the original fashions of the day continue to survive and be wearable – though of course every finite resource will suffer increasing scarcity. Photography inside is prohibited, so below is a gallery of a few details from the gift shop in case that kind of thing tickles your fancy. Standard adult entry is £10 (concessions are available), under 5s go free and the rest of the museum is free to enter and packed to the gills with things to see, so you can make a bit of a day of it. Though Fashion on the Ration is only on until the end of August, it was easy to find available tickets, so while I’d recommend advance booking, if you haven’t and you’re in the area I’d even chance it on the day. No disclosure needed as this was a private trip. Tom Scutt’s deceptively simple set. So, let’s start with the bad news: this is only running until the 1st of August, so be quick about picking up some tickets, yes? And now, in five lovingly constructed bullet points, the main reasons you should get your rear in gear and book them. It’s sweet, smart and surprising. Each scene is replayed multiple times, from multiple angles, but lightly and deftly and without the moralistic awkwardness of something like Sliding Doors. Louise Brealey (Molly off Sherlock if you’re wondering why this sounds familiar) is wonderful. As is Joe Armstrong, and it’s very much a partnership as they feed back and forth off each other – but she is especially captivating. And it’s one of those plays in which the hard work is evident, in a good way. Switching back and forth in moods, times; almost the same but subtly different conversations and multiple character arcs that develop over a non-linear narrative. It’s a masterclass in skill, as well as talent. It’s 70 minutes long, with no break. Even you can concentrate for 70 minutes. And the lack of interval means you can completely dive into the story and not be shaken by the non-linear narrative. 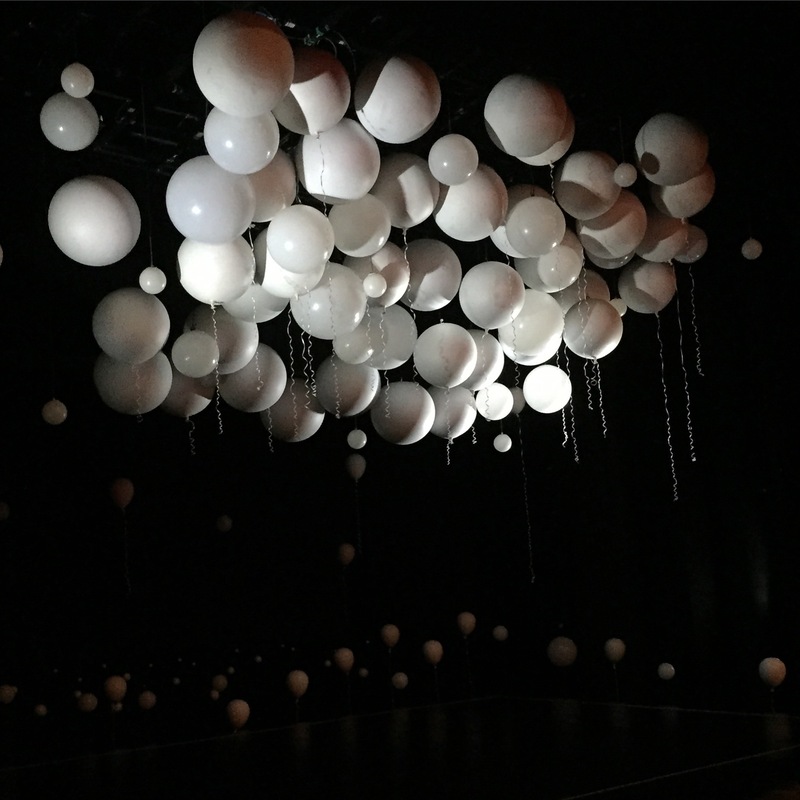 The set is gorgeous, and the subtle use of it as a mirror for the on-stage action is beautifully judged and not distracting or hokey. I loved it. I appreciate this might not sound like a convincing argument, but really why else does one bother to make a recommendation? No disclaimer needed; I saw this thanks to the kindness of a friend, not a brand. Kids… Poison… Well, as irritating as they get sometimes, I don’t think those are things people usually put together. I joke, of course, but despite its unsettling topic, this intriguing and beautifully curated exhibition – adapted from one created by the American Museum of Natural History in New York – is a fun family-friendly activity perfect for the upcoming summer holidays. For one reason or another, work has been quite crazy lately, so I’ve been really trying to make the most of downtime and focussing on doing fun things with my daughter. The PR team behind The Power of Poison kindly invited me to a VIP family day at the exhibition, and it was simply perfect timing; a chance to do something out of the ordinary together that was child-focussed and might even teach us all a thing or two. 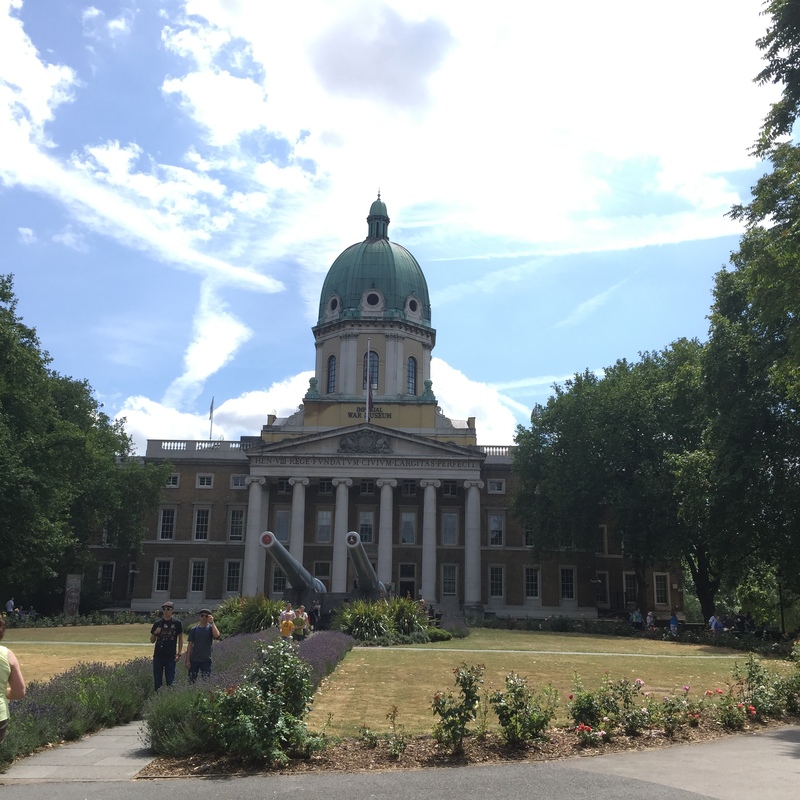 We do take her to museums relatively regularly – she’s developing a healthy fondness for my favourite place in all of London, the V&A, and it’s been heartening to see how many places go out of their way to offer activities for younger visitors. Two weeks later, though, she’s still telling us that the Power of Poison was her favourite ever, and promises it isn’t just because there was a Mad Hatter’s tea party and facepainting afterwards (the much appreciated VIP bit!). At a little under 5, my daughter is probably at the younger end to fully appreciate the details of the exhibition, but it’s a curious little treasure for all ages. Making the most of the dark, labyrinthine space of the Old Truman Brewery, the collection is wonderfully immersive, plunging you immediately into a jungle scene with a mixture of real and fake reptiles and bugs, deftly teaching the difference between poisonous and venomous. Kids are given a fun activity sheet which encourages them to actually read the display information and answer questions, and then it’s on to the next few rooms, with a mixture of models, projections and video to keep visitors of any age interested. My favourite was a beautifully projected shadow-theatre rendition of the stories of Hercules and Medea onto Greek urns; there was also a stunning book of poisons as a lead-in to a section on poison in literature that I gawped at for a while, and a truly eerie Snow White in her glass coffin. Anything Alice is bound to attract my attention, and the section on mercury poisoning and the Mad Hatter was very elegantly arranged. On top of all of this, there is then the detective section; at all times there are iPads set up in front of displays that allow children to work through three poisoning scenarios – a dog that might have eaten something in the yard, a ship’s crew that suffer terrible illness and a decidedly dead owl – and solve the mystery by collecting clues and examining symptoms. Throughout the day in this room there are also live and pre-recorded presentations that take the audience through a real-life case of poisoning and the history of the use of forensic evidence in British courts, all in a child-accessible yet engaging way. I had previously been to the Art of the Brick exhibition in the same space and had found it a little bit oppressive – but also, sadly, I just didn’t feel particularly moved by that particular collection (technically brilliant, but it just felt a bit lacking in story, or depth). The Power of Poison uses the space so much more effectively, and really delights in casting a creepy yet captivating light over what is a dim cocoon of a place. Although we were fortunate to be given some tickets for the purposes of this post, it’s definitely an experience I would have paid for, at £9 for adults and £5 for children (with concessionary prices, family, group and school tickets available). The Power of Poison runs daily at the Old Truman Brewery in London until the Sunday 6th September, and you can book in advance online. Disclaimer: For the purposes of this review we were invited to a family day including exhibition entry, tea and facepainting. All opinions are our own. This post is actually long overdue. It was (gasp) MARCH when I footled off to Bexhill to spend a day with a good friend and explore the loveliness of a classic British seaside town. But it hasn’t left me, because – especially for a born Londoner who has only managed to take herself further away from water by moving to the Home Counties – there is something so very lovely about the British coast, the jumbled mix of hipster-chic and genuinely crumbling, the proliferation of junk shops and charity outlets and the immediate sense of letting out a big breath you didn’t know you were holding the moment you leave the city. Bexhill isn’t one of the classic treasures (usually in Wales or Cornwall) that you see dotted around tourist websites, all vying for a Portmeirion-esque chocolate boxness that is very, very pretty but somehow unconvincing as a living town. Bexhill is not a town of summer homes. Even in the cold, damp English springtime it was alive and well, keeping calm and carrying on. Memories of Ladybird – a truly excellent story! Our ostensible reason for meeting there – K’s parents live in Bexhill but she’s actually based in St Leonard’s – was to visit the Ladybird by Design exhibition at the De la Warr Pavilion, which was absolutely wonderful, and – though it has completed its run in Bexhill – is due to arrive in London in July. I’d recommend a visit to the DLWP any day, whatever the exhibits – it’s a lovely space, beautifully situated. Go in, have a coffee, browse the little shop crammed tastefully with quirky prints, arty bags and cute knick-knacks. 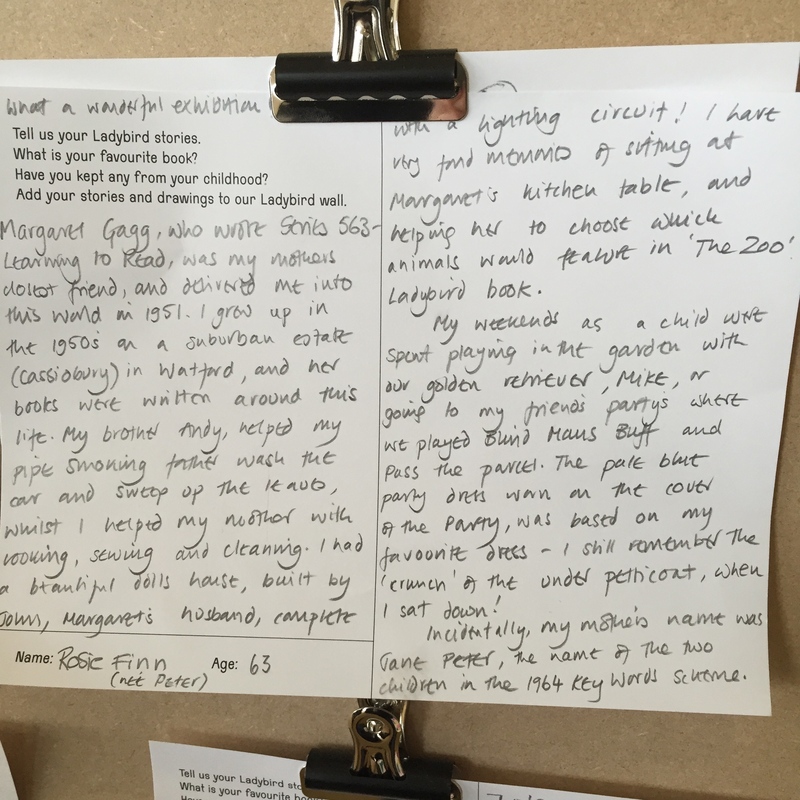 There are lots of planned family activities too; for the Ladybird exhibition there was an entire wall covered with memories and experiences of Ladybird books from visitors aged 5-95. My favourite (pictured) was a wonderful note from a woman who had, as a child, become the basis for some of the classic illustrations! Having spent a couple of hours digging around the wonderfully curated galleries and picking up a few treats at the gift shop (an amazing late 50s living room print now hangs over my retro dressing table), we considered what we could do with the rest of our day. That led us to the Little British Tea Shop, which was practically guaranteed to appeal to me on every single score. Vintage decor and mismatched crockery? Check. Bountiful savoury options (including a savoury only tea)? Check. A proper, lengthy, loose leaf tea menu with everything from builder’s to oolong? CHECK. We sat in the kitschest and cutest of window seats and shared a crumpet smeared with salty butter and a delicious cuppa and it was glorious. I was wearing a 1960s fuchsia Lane Bryant suit skirt from my vintage collection, but bitterly regretted not having a 40s number and pin curls in (I haven’t mastered Victory rolls yet). The service is friendly and warm and practically out of a film. And the prices are distinctly un-London at around £14.50 for afternoon tea for two. That was when K suggested we pop to the antiques warehouse up past the police station; it was a short walk out of town, but entirely worth every minute. I want to go back with a truck and someone else’s credit card. Eras of Style is a mammoth two-story treasure trove packed to the gills with vintage furniture, records, toys… you name it. It’s a little light on clothing, but crammed with practically everything else. I fell in love with at least three separate tables (so. much. G-Plan.) 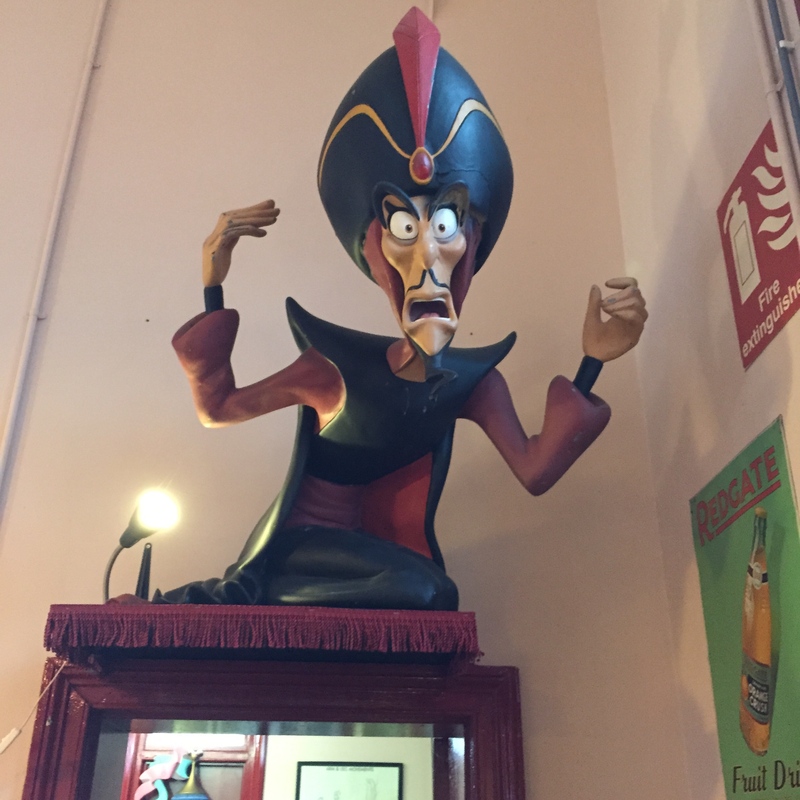 and I adored the more random bits and bobs like the 60s fairground attraction car and some crazy bits of Disney memorabilia like Jafar here, hanging out in the coffee shop. The cafe is itself worth a visit, with nice tea, multiple cake options – I spotted gluten-free ones, too – and apparently now a specialism in bagels (I am SO going back). Sea air, wonderful places to have tea, art and vintage style. And the wonderful thing is that this kind of footprint is repeated readily across Britain, and should be loved and treasured for what it is. I do worry that one too many hipsters like me and the places risk being gentrified; then again, a lot of these towns have suffered rising unemployment and could do with an investment of cash and love (preferably from people with an interest in staying in, rather than exploiting and running from, the area). I often wish I could travel further, wider and more often (how ungrateful that sounds after a trip to Florida!) but I also forget that there are little jewels on my doorstep – a drive or cheap train trip away. I’m aware that, especially from a distance, I’ve romanticised things a bit, but I do want to make it a habit to explore more of what’s right in front of me, and make the most of the beauty of home. What’s your favourite hidden (or not so hidden) British treasure? Where should I visit next? I’ve slightly irritated myself before I’ve even started this post by putting ‘surviving’ in the headline. To be honest, I’ve done it to pander to the kinds of ways I see people talking about this (ergo, perhaps, searching for it). Let me reassure you, there is no survival involved, although you might occasionally get a bit shirty with one another. It is, genuinely, meant to be fun. Sure, there’ll be at least one moment where you’ll threaten to sell your kids to Mickey for a Dole Whip and five minutes’ peace, but come on. You’re in Walt Disney World. You are not suffering. That happens when you get home.